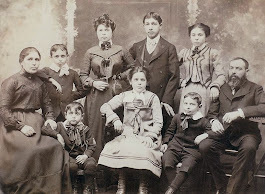 Discovering Our Connections: Was Fraidel Filshstein Gillick the mother of Joe, Louis and Jacob? Was Fraidel Filshstein Gillick the mother of Joe, Louis and Jacob? How Accurate is the Age in the Census Records? My interest in genealogy started 4 years ago. 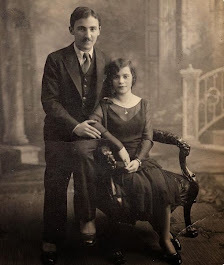 When I started looking at pictures that my grandparents had, there were many people who were a complete mystery. 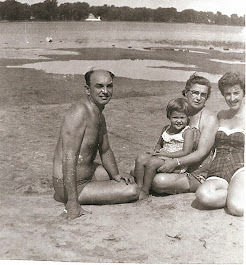 Where were these pictures kept when my grandparents were alive? 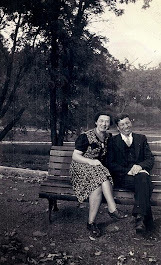 One picture that interested me was Joe Gillick sitting on a park bench with my grandmother who also was smiling. It was rare to see my grandmother looking so content. To me that picture was a treasure. Who was he? According to the 1911 census, Joe was born in January 1889. His father was Chaim Abraham Gillick. I learned this from the translation of his gravestone. Joe died 7 Jun 1956 and was buried in Sherbrooke. Who was Joe Gillick's mother? Fraidel Filshtein (born about 1856 in Ostropol, Volynnia, Russia and died in Sherbrooke, 14 Apr 1931) was remembered by her Echenberg relatives as being a Gillick. 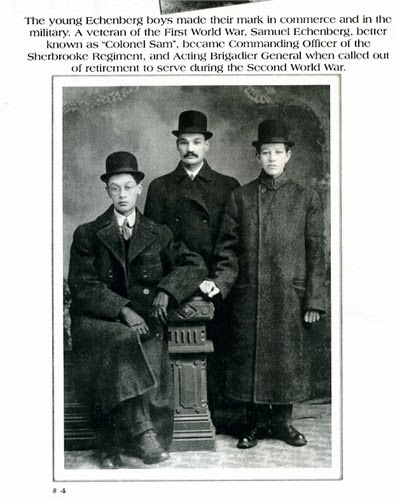 This is very intriguing since there are 2 brothers, Joe and his brother Louis Gillick who immigrated to Sherbrooke. We do know that Fraidel married Israel Echenberg and had 5 children. Louis, Dean's grandfather, was the first born, April 1880 in Russia. This would mean that her children with her first husband Gillick would have to have been born before 1880. Joe 's birthdate would be off by 10 years from the 1911 Census birthdate, He would have been born ~1879. 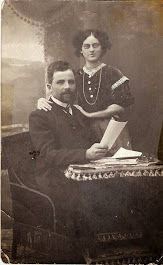 That would mean that Fraidel would have married Chaim Abraham Gillick and was the mother of Louis Gillick, born about 1876, Jacob Meier, born 10 Nov 1887 and Joe, born abut 1879. The further connection that links brothers, Joe and Louis and Fraidel was centred around Fraidel's third marriage to a widower, Samuel Genat. Fraidel's second husband, Israel, had died 29 Jul 1918 in Ostropol. The date was shown in the Sherbrooke Yizkor Tablets. 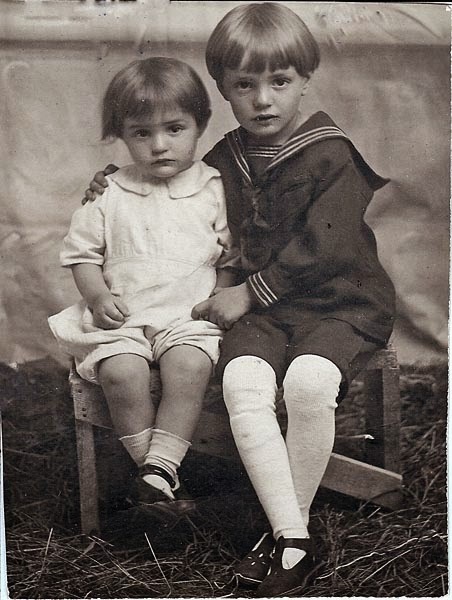 Fraidel had arrived 20 Aug 1921 with her 3 youngest children, Jack, Claire and Isadore. She married Samuel Genat 28 Sep 1927 according to the Drouin Quebec Vital Records. What is interesting is that one of the witnesses is Joe Gillick. As well, when Fraidel died 14 Apr 1931, it was Joe Gillick who again was a witness. Furthermore Samuel Genat lived with both Joe and his brother Louis on 41 Alexander in Sherbrooke in 1935 as shown in the Canada, Voters Lists. so the level of association is clearly close! Deb had done all this research yet I still can not understand how the birthdates could vary by 10 years and why Joe would not clearly state his birthdate as 1879 if that is what it was? I went back to Dean who knew Joe, who had lived with him. Dean initially thought Joe was just a few years older than his father Sydney who was born in 1908. With this new information, I asked him what he thought. He answered with the question he was reflecting on, "Was Joe Gillick 25 years older than my father, ie was Joe the same age as my grandfather? It is very difficult to tell and I am not sure. Joe was beardless and eunuchoid and it is almost impossible to guess his age. He was never referred to as uncle by my father but simply as Yussel. He was quite differential to my father because he worked for him, so there was a curious connection. I think that could substantiate a closer relationship than simply one of normal work. We have not been able to find Joe's Passenger Record. Did he immigrate with another family? What all this reinforces is that dates on records are just part of the picture, that being able to reflect on our memories and brainstorm with others is so vital!